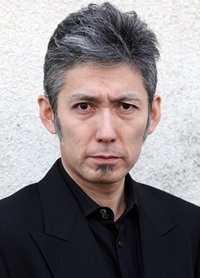 Oji Osuga was born on 1966 in Tokyo, Japan. When he was a child, many people used to think that he was a girl because of his adorable face. When he was a child, he learned how to play the piano. He also learned how to play the trumpet after piano. The first public acting performance he had was for a Greek drama in elementary school's graduation ceremony. While he was in junior high school and high school, he was very active. He wrote articles for school newspaper, played at music festivals in the school. He also had an opportunity to homestay in San Francisco, United States for 3 weeks. It was around this time that he saw the performance of Snakeman Show and one of its actors Masatou Ibu that made Oji to aspire to becoming a professional actor. So, he went to Nihon University College of Art to study acting. However, he mostly performed for inside films, playing mah-jong, drinking alcohol heavily outside school. Finally, he chose to leave the university to focus on acting. He then acted for theatre performances while joining various workshops. He changed his stage name to the current name, Oji Osuga, from his real name. He has been acting under free agent since 2013. He quit drinking alcohol to stay healthy and because of his wife's request. Copyright © 2013-2016 O.S.G. All Rights Reserved.